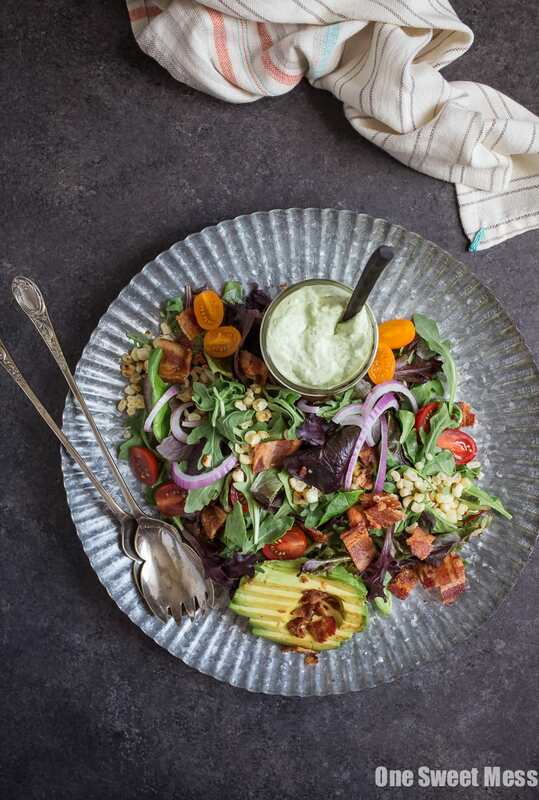 This BLT Salad with Grilled Corn and Avocado Ranch Dressing has become my go-to salad for lunch. I can’t get enough of it. The thing I love most is that the components of the salad can be made and prepared in advance. When you’re ready to serve, toss the ingredients in a big bowl and drizzle with the avocado ranch dressing (so good!). Another option is to prepare the salad and dressing in advance and divide each separately between individual airtight containers for an easy lunch option during the week. Store the containers in the refrigerator until you’re ready to leave for work in the morning, and then grab and go. I’ve been eating this salad non-stop for days–breakfast, lunch, and dinner. Yup, I said breakfast. It’s amazing topped with a fried or poached egg. The drippy yolk mingles with the tender greens and it is beyond tasty. The dressing is a twist on my Homemade Buttermilk Ranch Dressing. I used 1 large avocado and a little less mayo. 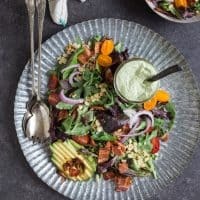 The creamy avocado adds a lovely green hue to the dressing. It’s also a hell of a lot healthier than mayo, adding a boost of fiber, folic acid, and healthy fats. I used a combination of fresh parsley, dill, chopped scallions, and garlic to the dressing. It doesn’t lack in flavor, that’s for sure. I splash of buttermilk helps thin out the dressing, but, more importantly, it adds a delicious tang to the dressing. This will soon become your favorite summer salad, too! To make the dressing, add everything to the bowl of a food processor and pulse until smooth. Season with salt and pepper to taste. Transfer to an airtight container and store in the refrigerator. The dressing will stay fresh in the fridge for 1 week. To assemble the salad, add all of the ingredients to a large bowl; toss to combine. Season with salt and pepper. If you’re prepping the salad ahead of time, don’t add the avocado until the day you’re ready to serve. If you’re unable to locate Beau Monde seasoning, substitute seasoned salt, starting with 1/4 teaspoon and adding more to taste. The recipe doesn’t call for cheese, but that doesn’t mean you can’t add any. Blue cheese crumbles or freshly grated Parmesan cheese would be delicious. I wish I had this salad waiting for me for lunch! Love the grilled corn!